This morning I'm featuring a post by guest blogger, Greg Stewart. I met Greg on Google+. 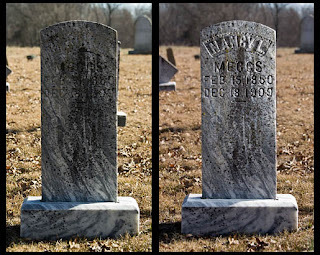 He has a very innovative way of improving gravestone photos which helps take the "luck" out of photography to make consistently good photos. Greg is going to tell you how he does it in his own words. I began photographing tombstones of my ancestors after retiring a few years ago using a Nikon D40 DSLR camera. I then jumped into researching who these people were which led to more gravesites to photograph. Some of these cemeteries are well kept while others have been abandoned and overgrown. Many of the stones are hard to read while looking at them in person, and the photographs were not any better. At the right time of day the sun worked in my favor to light the stone for a decent photograph while other days would be overcast. I soon learned through online blogs (Strobist) how to use a flash off camera for more pleasing light. There are different methods of triggering a flash off camera, but the one I chose for the Nikon D40 was a cheap wireless trigger purchased through Cowboy Studio on Ebay. This includes a wireless trigger to mount on the hot shoe of the camera, and a wireless receiver to mount to the flash. I use a Nikon SB600 speedlight with this camera. This flash, and others are capable of being used on a manual setting so you can power down the output of light. With this new capability I returned to many of the gravesites and photographed the hard to read stones. With the flash on a light stand I adjust the flash output to 1/8th to 1/16th power, and place it to the side of the stone a few feet away. Lighting the stone from the side causes shadows on the engraving enabling you to very clearly read the inscription. In the Nancy L. Meggs photograph you notice her first name and middle initial are raised letters. This was hard to read even in good sunlight. I have also used a reflector on a stand to reflect sunlight across the face of stones with good results. The downside to this is when working alone the wind will blow the reflector away, and you need sunlight. By using a flash on a light stand I can photograph any time of day with or without the sun. Greg Stewart is a retired Deputy Sheriff from Union County, North Carolina. He is currently a licensed Private Investigator in North Carolina specializing in pre-employment backgrounds. You will usually find him in a cemetery satisfying his hobbies of photography and genealogy. Photos courtesy of Greg Stewart. I have heard of people using a mirror for getting better gravestone photos but it (I admit) never occurred to me to use a flash. And a remote flash at that! Seeing Greg's posts on Google+ convinced how effective this could be. 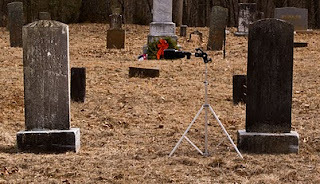 Sometime in the next few months I hope to get able to put together a remote setup like he has and see what I can do about getting better gravestone photos. I would also like to point out this is why I love social media! I learn things! If I hadn't been on Google+ and connected with Greg I never would have learned how to do this. Fantastic article Marian .... and special thanks to Greg for sharing his techniques. 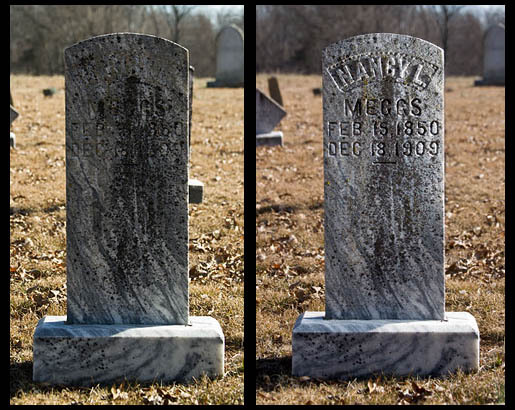 I have several trips to cemeteries planned and now I know the best way to photograph the older stones! Thanks ! I really needed this idea! 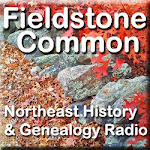 I am going back tomorrow with the trigger flash to re-read an 1850's limestone stone and it happens to be the ONLY record I have of this ancestor . Thanks for the RT Marian. It was your blog post here that prompted me to share my Tombstone Tuesday experience on Ancestral Wormhole. After reading this I looked at the gravestone photo's I took over 10 years ago and realised that I should do better! Santa hopefully will be bringing me a Canon 600D and a wireless flashgun. Researching on the internet makes you lazy, whatever you find on the web follow it up back to the primary source, you never know what nuggets of information you may find. Graveyards and Record Offices are such wonderful places! How Much Microfilm are We Losing? Data Overload: How to Create a Better System? How Many Times Do You Read a Document? The Mystery Heirloom has Arrived! Serendipity Encore - A Family Heirloom?